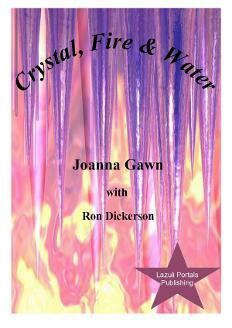 Crystal, Fire and Water is a short ebook which includes micro-fiction and short stories - a quick read and a free-with-no-strings-attached introduction to The Lazuli Portals style! *Please note that, while it is our intent that the ebook version of Crystal, Fire and Water always remains FREE, Amazon reserves the right to restore the price of the book to its list price (99p/99c - which is the minimum we are allowed to charge.) If the book is free at Amazon, it is as a result of something called 'price-matching', and something over which we have no control. You are always welcome to download this ebook - for free - from any of the other outlets listed above. Alternatively, you may download the Kindle version direct from our website via selecting the link below! ​A paperback version of Crystal, Fire and Water is now available, combined with The House of the Stormwind and other short stories as a duo-book. Some short excerpts from the books are shown below. You can see what other readers think of Crystal, Fire and Water here. “You only have three matches,” the man announced. “Use them wisely.” He turned the key in the lock behind him as he left. The light was snapped off, leaving me marooned in the blackness. Heart plummeting, legs weak, I sank into the chair. Trapped. The only person who could get me out of this was me. I lit the first match, a quivering glow of light leaping around the small room’s walls. It wasn’t long before the flame burned my fingers, the match dropping uselessly to the tiled floor. The darkness seemed even deeper than before. Keira’s focus fascinates Jason. She sees things he cannot, and he feels a flicker of envy. Her gifts take her on paths he cannot follow, leaving him behind when he wants to be at her side. Guiltily﻿, he pushes the feeling away, knowing that Lady Aida would simply tell him to accept what is, without resistance or fear. He sighs; he misses his one-time guide, her wisdom and her dry wit. He’d really felt a connection with her. She didn’t dare move. And so she simply stood there, waiting, watching, shivering with nerves. When nothing happened, she released the breath she’d been holding and crept back to the sofa. Maybe she was coming down with a virus and it was screwing up her senses. Maybe she just needed to sit down and rest, and close her eyes. Back on the sofa, feet curled beneath her, she willed herself to calm down. But she wouldn’t read any more of the Melton Grange book tonight. She’d wait until daylight. Retrieving the book from the floor, it opened at the last page she’d read, and she felt the tap on the shoulder again.